Parents, by lack of years of intense study and accreditation, are not dentists. Children, despite what they might pick up on SpongeBob Square Pants, are definitely not dentists. But are there instances where parents can be and may need to be their children’s in-house dentist for non-emergency and sentimental family situations that just can’t wait? Yes, and we’re talking about baby teeth removal. Losing baby teeth, especially for children eager to see what the Tooth Fairy will exchange for their tooth, is a beloved childhood rite of passage. For many kids, it’s a sign that they are no longer little kids. Between the ages of 6-12 most kids will lose 20 primary baby teeth. Most children begin to lose their primary teeth around the age of 5 or 6 years old. Most kids lose their front bottom teeth first, followed by their front top teeth. In most cases, dentists recommend parents allow kids to play dentist themselves with loose teeth. Not that parents’ string removal method won’t work, but children know better than anyone if removing a baby tooth too early will hurt or not. So parents need to put down the pliers and step away from the six-year-old. Parents who pull a tooth too early may inadvertently be risking damage to sensitive tissue, and increasing the possibility of infection, bleeding, and pain. For parents, patience is the best policy. And in this rare case, children are their own best dentist. Parents should encourage children to gently wiggle their tooth loose until it falls out on its own. Parents understandably may worry that their child could choke on their tooth, but it’s highly unlikely problems will occur. 1) Some children have baby teeth that won’t budge even when adult teeth are pushing through. In some cases, an adult tooth can become impacted and grow sideways if existing baby teeth don’t make room. In both cases, a call to Alpine Kids Dentistry is required. “The ones that really concern us are the ones that won’t fall out,” said Dr. Sidney Price of Worthington Pediatric Dentists. “If they won’t fall out, we have to remove them … to allow the adult tooth to straighten and get into that spot. 2) If a baby tooth that has moved out of the way is on the verge of falling out, but annoying to a child – to the point that he or she avoid brushing the area or eating – it’s fine for parents to help a little. In these cases, dentists recommend an over-the-counter anesthetic, a tissue to grip the tooth and a distracting fib. “Don’t tell them you’re removing it. Tell them on the count of three to sneeze, and you pull the tooth out at the same time, and it’s gone and you give them another Kleenex to bite on. It’s over with,” Price said. For kids nervous about losing their first tooth, parents should remind them that it only takes a few weeks for their new tooth to grow in. As for first-time Tooth Fairies, a parents.com poll shows the going rate today for a lost tooth is $1. 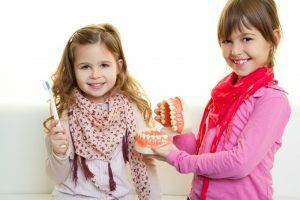 And for any questions about your child’s dental health, consult the experts at Alpine Kids Dentistry.